WJSG Internet Radio: What happens if the price of music falls to zero? What happens if the price of music falls to zero? Shares of Pandora fell on Tuesday and stayed down after Wedbush Securities analyst Michael Pachter downgraded the music-streamer's stock from "outperform" to "neutral." Shares were recovering slightly on Wednesday morning. Pachter cited competition from Apple's reportedly forthcoming music-streaming service. That was just one of the "headwinds" facing Pandora, he noted. But the strongest headwind facing not only Pandora (P) but the entire music business is the continued fall of the market price of recorded music, whether that price is paid by listeners or by advertisers. No matter which type of delivery, the hard fact is that a growing segment of the audience no longer expects to pay for music, or at least expects to not pay much. Ad rates, particularly on the mobile platforms that people increasingly favor for streaming music, are in the basement. So the streamers are squeezed, but so are the music labels and the artists. The New York Times' Ben Sisario on Monday examined how little all but the most popular artists earn when their music is streamed. Even a million listens might yield just a few thousand dollars or less. In a followup blog post on Tuesday, Sisario noted a big, so-far-unanswered question: Will people continue to want to own their own music, or does the future lie in streaming -- the great "celestial jukebox?" The answer will help determine what kinds of revenues the industry can expect to earn. And that doesn't even take into account the many legal questions surrounding the music industry, such ashow to set royalty rates for the various kinds of streamers and radio outfits (both on the Internet and off). Some observers note that artists were similarly squeezed when CDs came along in the '80s. CDs were considered specialty products, and at first, artists got relatively little, if any, money from their sale. That all changed as CDs quickly became the favored format, and the music business saw a renaissance that peaked in the late '90s. The same thing will happen with online music, the optimists argue. But the economics are very different this time. CDs were more expensive than cassette tapes and vinyl albums. The margins were far higher. The situation now is the precise opposite, and people -- especially younger people -- have come to expect their music to be free. That's why so many kids get their music from YouTube (and why lots of people continue to download unauthorized copies of songs). And yet, some investors seem to think that the economics will eventually work themselves out, somehow. Digital Music News noted last week that, even though total venture capital investments fell by 10 percent last year, venture investments in music startups rose by 34 percent, and several of the top recipients of capital were streaming companies like Spotify. Those investors had better hope the economics turn around. 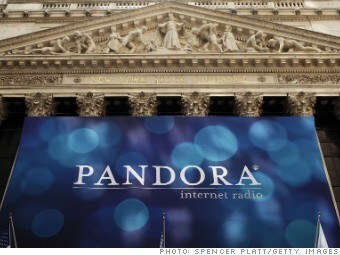 Pandora's stock has lost nearly half its value since the company's IPO in June, 2011.